Après Furniture supplies the very best CPU Holders available on the market today from leading manufacturers such as British pioneers Colebrook Bosson Saunders. Our range of modern CPU Holders provide under desk storage solutions for the modern office workplace which are easy to install. Having a computer stand on your desk takes up an unnecessary amount of precious work surface area. However, putting your PC tower unit on the floor prevents air circulation and can lead to an accumulation of dust. Over time this can mean your CPU runs less efficiently, overheats, and even stops working entirely as a consequence. This is why a CPU holder which is installed under your desk makes so much sense. 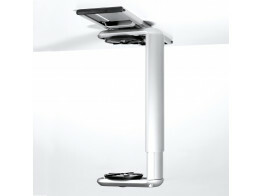 An under desk computer mount saves valuable desk space whilst ensuring optimum ventilation. Furthermore, under desk cpu holders greatly minimise the risk of your computer tower being damaged by traffic in the office, be it clumsy feet, office chairs, or a vacuum cleaner. We supply CPU Holders which fit the majority of central processing units, as well as thin client cpu holders to accommodate modern pc units which are often smaller than their predecessors. Modern CPU holders are designed with the ergonomics in mind as well, meaning that access to connections and cables is easy thanks to 360° rotation, whilst the control buttons at the front are also comfortably within reach thanks to horizontal glides, meaning the CPU can be brought forward. Safe, durable, easy to use, CPU Holders are a worthwhile investment. Not many other CPU accessories will safeguard your PC like contemporary CPU holders from Après Furniture. 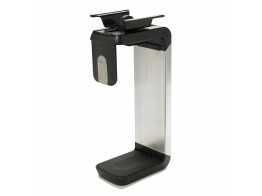 CPU600 Holder offers 360-degree swivel and horizontal glides to bring CPUs within easy reach. Jaw CPU Holder provides easy access to cables, allowing you to rotate the CPU unit 360°. Easy to install, Loop CPU Holder is supported by webbing, easily tightened by a ratchet mechanism.